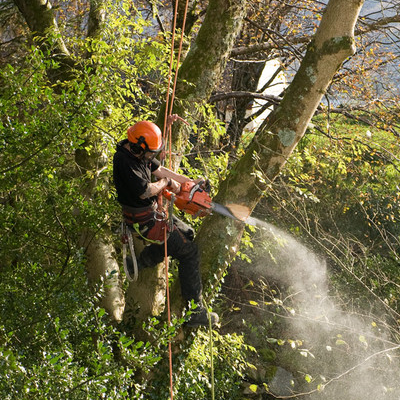 Tree removal is our most popularly requested service. It is also the most involved and extensive service that we perform. Removing trees is not overly complex yet it does require experience and equipment. Tree Service Dayton OH has been removing trees in the Miami Valley since 2001 - we have removed virtually every species of tree indigenous to SW Ohio. We have also removed every sized tree, from smaller 10-15 year olds to over 100 year old trees. 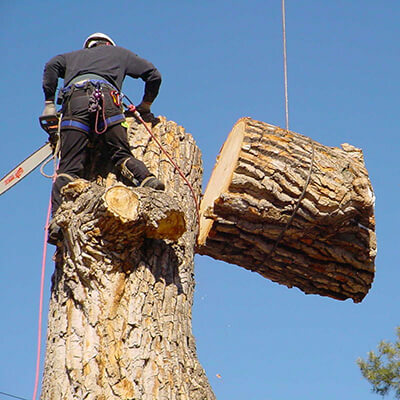 Our tree removal service begins with a free on-site assessment of the tree(s) to be removed. At that time we can assess and discuss if our heavy equipment can safely access the area or if you prefer we just climb the tree - either way, the price will be the same. We will provide you with a verbal estimate and then a written one from our office safe detailing the service, cost, and providing insurance and licensing information. At that time, we can schedule you to have the tree removed. We are usually only out about a week from when we can schedule your job. On the morning of your schedule tree removal, a Tree Service Dayton representative will call you to confirm the time our crew will be onsite. We provide our customers with a two-hour arrival window - we may be a bit early or late due to ensure our last customer is 100% satisfied. Our tree removal process starts with the crew foreman assigning team member to various roles for the job: ground crew, clean-up chipper, lead cuter, and branch cutter(s). As the work being, we will methodically dismember the tree starting with the crown and work our way down. Regardless if we use heavy equipment or merely climb the tree, we will remove the tree limb by limb, lowering each branch safely to the ground where our crew will further reduce it. 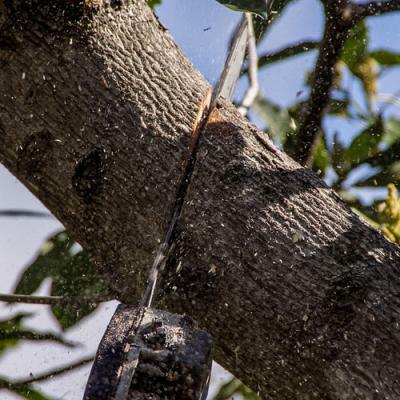 We provide our customer a guarantee to cut each branch or limb into three f00t sections, making for easy splitting for firewood. We will continue down from the crown until we are left with just the main truck in about a ten to fifteen-foot section. We end the tree removal process by cutting this main truck off at a height suitable for grinding; or, we can certainly cut it to any height you specify. During this entire process, our ground crew will keep the area free of tree branches and other debris. Once the tree has been reduced to just the stump, you can optionally decide to have the stump removed or ground. Or, as some of our customers have done, you could make a decorative planter out it. If you opt to have the stump ground, we will cut it as close to the ground as possible to more easily facilitate grinding it. This will enable our Vermeer stump grinder an easier start to the grinding process. Depending on your preference, we will haul all the wood away or we can stack it at a location of your selection. The tree removal process ends with our ground crew completely racking the surrounding area free of small branches and other tree debris. When we depart, your landscape will be untouched less one or more removed trees. We know tree removal is not always the most pleasant choice when it comes to your landscape and wallet. However, there are a number of very valid reasons to have a tree removed. These reasons can range from it being planted to close to your home and is now encroaching it to a tree that is dead creating a hazard to call onto your roof or cars. While tree removal can be expensive, due to the labor and equipment costs, Tree Service Dayton does their best to work within your budget. We also offer payment plans if you need to spread the cost out over a series of months. Please call us for all your tree removal needs. Or, fill-out our Contact form for a free tree removal estimate. We are licensed, insured, and the tree removal Dayton OH trusts. There are 3 factors that drive the overall cost of tree removal: tree size, tree location, and tree species. Tree Size - the larger the tree, the more expensive it will be to remove. This is because we will have more labor and sometimes equipment cost. It just takes longer to remove a large tree (vs a small one). And essentially, while we price our work per job, we are basically an hourly business. Tree Location - a tree located near electrical lines and/or buildings/homes, will take more effort to remove as precautions must be taken to protect these structures. Tree Species - a single trunked tree will be slightly cheaper to remove than a multiple trunked tree.